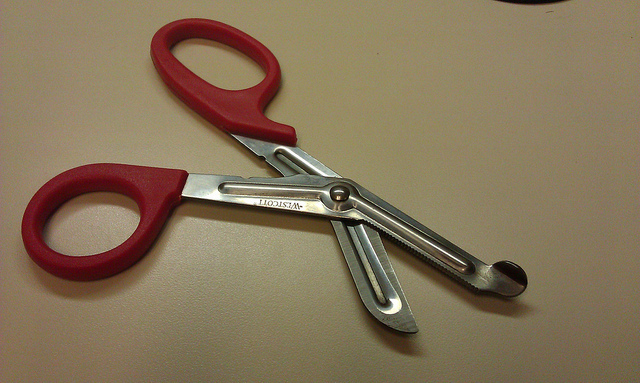 These were my office scissors. They were some special kind of scissors which are impossible to cut or poke yourself with, which shows what management thought of our abilities. I admit that I do get distracted while I work from home. I do go throw in the occasional load of laundry, or stand in front of the fridge looking for snacks. See why it doesn’t bother me to get distracted at home? I still get 3 more hours out of every day. Honest, boss, I do. I work from home at times & I am highly distracted but I would rather do that than run the risk of being talked to death by my co-worker. If I REALLY want to be productive I work at the office when I know she is working at home. I have been working from home for the past 10 years and on the whole I like it but I was getting interrupted by my children and also kept stopping to do domestic tasks (like filling the washing machine) SO my solution was to kit out my garden shed to be a home office. It now has electricity, heating, phone and internet and is warm all year round. I get much less interruptions from my children and I am not tempted to stop and “do something domestic”. One thing I don’t have kids is disrupting me. The dog is bad enough – she goes outside and the door stays open. I reach over to shut the door and she pops back inside as if to say “Why is the door closing?” Then she wants to go out again 3 minutes later. (I only have one door). I work from home 100% of the time, and it is sometimes distracting, but I think more often my problem is working too much instead of too little. “Oh, I’ll just put dinner in the oven and then come back and finish this project” is better than being stuck at work and not having dinner in the oven at all, but it’s not as good as turning off the computer and being DONE for the day.